IMAGINE you’re in business and you’ve taken a chance on renting premises at Westfield Stratford City shopping centre. That’s a big investment. After the initial rush, custom has fallen away and you are looking forward to Friday 27 July, the day of the 2012 London Olympics opening ceremony, which will surely be the season’s most lucrative. Out of the blue you are told that businesses at Westfield have to close by 3pm that day. 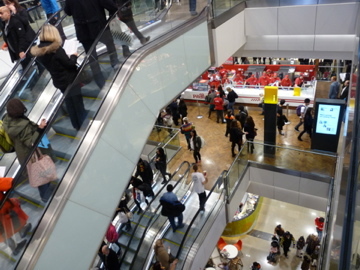 A Westfield statement says: “The centre will be required to close at 3pm to assist Locog (London Organising Committee of the Olympic Games and Paralympic Games) with the logistics of the opening ceremony. This is the kind of weasel waffle beloved of organisations that have to make embarrassing announcements. So the reason, the “consequence”, is impossible to understand. Loving Dalston guesses it’s a panic by the organisers at the thought of crowds bigger than can be easily controlled. So, give your staff the afternoon off and try not to think about the now-silent tills.